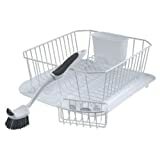 The wire dish drainer is 14.31" x 12.49" x 5.39" and the small drain board is 14.38" x 15.38" x 1.3"
Interested in the Rubbermaid Antimicrobial Sinkware Set, 4 Pieces, White FG1F91MAWHT? Is the price too high? You can easily price watch this product and we'll notify you when the price reaches your target.